Much of that surge in positive coverage, the data suggest, was tied to Obama’s strategic position, including improving opinion polls and electoral math, rather than directly to positive assessments of Obama’s response to Superstorm Sandy. than the 39% that was devoted to such issues throughout the entire race. So there you have it. In the final week, the press finally figured out that Obama was leading in the polls, and the press always writes more glowingly of winners than losers. Yay press corps! 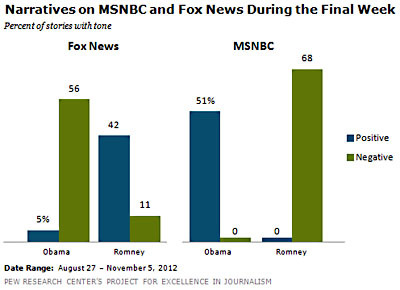 In other news, Pew also charted the coverage of Romney and Obama on Fox News and MSNBC. Their conclusion: both networks had favorites, but “in the final week of the campaign, both Fox News and MSNBC became even more extreme in how they differed from the rest of the press in coverage of the two candidates.” Italics mine. Which network was the most extreme, though? Anyone who thinks that MSNBC hasn’t yet become fully Foxified might be surprised at the answer, but Pew found that in the final week MSNBC aired precisely zero stories that were either positive about Romney or negative about Obama. Welcome to the 21st century news bubble.